City's firepower, Chelsea's experience or Arsenal's finesse -- who will emerge from the Premier League's three-horse race? Our analysts weigh up the strengths and weaknesses of the top three contenders. This title race has become a contest between the exuberance of Arsenal and Manchester City and the expediency of Chelsea. If symphonic forward play is to prevail, City will be the irresistible force that overcomes Jose Mourinho's immovable object. Those of us who picked Chelsea to be champions back in August are bound by that prediction. With each game Mourinho turns them into a points-accumulating machine, less concerned with entertainment than grabbing a goal or two and shutting down the opposition. But there is a magic about City's attacking play that should now be decisive, provided they continue to treat away games seriously and concentrate properly on defending, which they failed to do in a 4-2 win over Cardiff at the weekend. That win sent City crashing through the 100-goal barrier in all competitions and left them one point behind Arsenal, who continue to rely on Olivier Giroud as their only A-grade striker. Though Arsene Wenger's midfield are making up the shortfall, City have scored 63 times to Arsenal's 43 and can call on Sergio Aguero, Edin Dzeko and Alvaro Negredo, as well as Stevan Jovetic when fit. City's golden formula was to buy early and well in the summer, appoint a coach who is in synch with their stylistic principles and remove the friction of the Roberto Mancini years. The only flaw in Manuel Pellegrini's scheme is that the defending is sometimes inferior to the attacking, as Martin Demichelis showed against Cardiff. But even if opponents score against them, the avalanche at the other end is likely to be unanswerable. 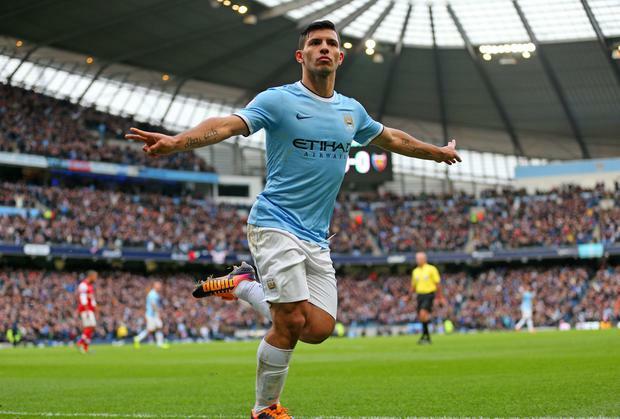 Negredo, Dzeko and Aguero have scored 58 times between them with 16 league games left. Arsenal, who are travelling sweetly and defending well, cannot match this firepower. The greater threat to City is Mourinho's reversion to a way he knows and loves. Chelsea's flirtation with champagne football was abandoned when Mourinho started to feel offended by how many goals they were conceding. Now, he wags his finger at Ramires when he makes forward runs and berates David Luiz for abandoning defensive midfield positions. When the game is won, Mourinho sends on guard dogs to protect the points. City will not find this pragmatism easy to overcome. Only one point separates them. Samuel Eto'o, supposedly signed as a golden oldie to make up the forward numbers, helped himself to a hat-trick against United. The cost to Chelsea of returning to Mourinho's favoured caution, though, is to inhibit their most creative players: Oscar, Eden Hazard, Willian and Juan Mata, who stews in internal exile. Mourinho can make Chelsea pitiless again but there is nothing he can do to stop City blowing teams away. After a year of resting on garlands and fighting with Mancini in 2012-13, this City team look hungry for prizes again. These players must know life has blessed them with a chance to dominate the English game for five seasons to come. The fixture list will tell us soon. Between now and April 12, City must travel to Spurs, United, Arsenal and Liverpool. Six days after the game at White Hart Lane on Wednesday week they face Chelsea at the Etihad. The rest of the league know, however, that City are inspired by big-name opposition. This season they have beaten United 4-1, Spurs 6-0, Arsenal 6-3 and put six unanswered goals past Newcastle home and away. Like Barcelona and Bayern Munich, City know they will win if they play to their full attacking potential, even if it has to be 4-2 or 5-3. This is a rare and special power which Pellegrini's men are unlikely to waste. There is an undeniable glow above the sky-blue half of Manchester. Neutral optimists wants to see Wenger rewarded for sticking to his faith when all seemed lost. City, though, have extra dimensions. Mourinho is not just playing mind games when he says Pellegrini's team have a "responsibility" to win the league this year. While Arsene Wenger and Manuel Pellegrini cope with pressures of hope and expectation, Chelsea manager Jose Mourinho may already have produced the greatest trick of this season's three-way battle to finish top. It was simple - he let everyone know that they should not really consider Chelsea as title contenders this season. He started planting the messages almost as soon as he arrived back. He was quick to point out that Chelsea had finished 14 points behind Manchester United last season and that the Europa League success was no consolation for missing out on the Champions League knockout stages. He highlighted the fact he was inheriting a squad who would take time to mature, while City had spent fortunes on proven talent and Arsenal's young players had been together longer than his. As Olivier Giroud started the season on fire for Arsenal and Sergio Aguero and Alvaro Negredo quickly hit their stride, the modest one claimed he was not lucky enough to have match-winning strikers. When asked whether his references to City as title favourites were designed to pile pressure on Pellegrini, he claimed he was not capable of such an act. Every time Mourinho has walked into a press conference this season it has been with the intention of trying to convince the world Chelsea need a miracle to win the league. Expectations have been lowered to such an extent that Chelsea fans seem grateful they are still involved in the title race. Mourinho has positioned himself and his players brilliantly. Win and they will have exceeded all expectations. Lose (or finish third) and they will be applauded for their bravery in the face of adversity. But results this season tell a different story. Chelsea are the only one of the top three yet to be beaten by any of their title rivals. Mourinho's men have won against City, United and Liverpool at home, drawing at Arsenal, Tottenham and United. The only top eight teams they have lost to are Everton and Newcastle. But still Mourinho refuses to deviate from his position of trying to convince Arsenal and City that, in terms of the title, Chelsea do not exist. Even his players have bought into it. Samuel Eto'o's hat-trick secured a 3-1 victory over United on Sunday, but claimed expectation should not be put on Chelsea. Eto'o said: "The teams that have to win everything are teams like Manchester United and the teams ahead of us. We know Chelsea finished quite far behind last season. Next season we will have the duty to win. This season we don't have it." Asked if he means this is a transitional season, Eto'o hammered home Mourinho's message, adding: "Exactly". As Keyser Soze, Kevin Spacey delivered a famous line in 'The Usual Suspects' when he said: "The greatest trick the Devil ever pulled was convincing the world he didn't exist." Mourinho, who has more than a bit of devil about him when it comes to mind games, insists his side's title chances do not exist. It could be the greatest confidence trick of the season. Of course they can win it, and the pressure is off. If we are judging solely on depth of squad, on title-winning experience and the ability to roll over opponents with sheer power and know-how, then, yes, Manchester City and Chelsea hold the upper hand. Both teams, on paper, look better equipped to go the full distance. But you simply cannot ignore Arsenal's achievement in arriving at this point. With over half the season gone, having already faced their rivals once, Arsene Wenger's team deservedly sit at the top of the table. Say what you will about that thrashing at City or disappointing defeat at Manchester United, Arsenal have shown themselves capable of dealing with the pressure to keep their noses in front. To maintain this, though, so much depends on the back four staying together, particularly the centre-halves who have a great understanding. Per Mertesacker and Laurent Koscielny have been sensational so far in providing a solid platform that has allowed the boys further forward to do their thing. The best defence in the Premier League: who would have thought that in recent seasons when Arsenal were shipping too many soft goals? As it is, they have worked very hard on organisation and shape to cut out the errors that were holding them back. No longer does that rearguard find itself exposed by a gung-ho approach that would leave the side stretched when they lost the ball. If they can carry on in this vein, and there is no reason to think they cannot, Arsenal are well capable of ending up on top on May 11. That would be fitting reward for players of the quality of Jack Wilshere, Aaron Ramsey, Santi Cazorla and Mesut Ozil - the most technically gifted creative unit in this division. No fear here of coming up short. Wenger can rotate his midfielders to keep everyone fresh without suffering any dip in quality. Theo Walcott's injury is a blow of course, but the emergence of Serge Gnabry, the return of Alex Oxlade-Chamberlain and the talent of Tomas Rosicky might be enough to plug the gap. Factor in the defensive instincts of Mikel Arteta and Mathieu Flamini and you are looking at a group difficult to better. The only concern is the much-discussed lack of cover for Olivier Giroud. If the centre-forward were to get injured, Arsenal would lose so much of their threat, given how the Frenchman's back-to-goal style dovetails perfectly with those around. No wonder Mirko Vucinic has been mentioned as a target. But whoever plays, Arsenal must know that the toughest tests are yet to come. With Liverpool and United awaiting next month, a hellish-looking March will make or break their title tilt. Trips to Spurs and Chelsea precede the visit of City. Come through that little run intact and the players will really start to believe. And I do think they need a good victory against one of the heavyweights to make an emphatic statement. They have not managed that yet, hence the doubts. But were they to win at Stamford Bridge or beat City at home, the psychological impact would be huge. Few people truly believe Arsenal can do it. Most outside the Emirates think they will come up short. I'm not so sure. There is something about this side that instills a good feeling. Team spirit is tight in a dressing-room finally benefiting from some proper leaders. By Jonathan Veal, Press Association Sport Tottenham manager Mauricio Pochettino has refused to rule out the possibility of Harry Kane playing again this season.